Is there a 'ready made' Littrow design? Is there a ready made design for a DIY Littrow? Dimensions, lens focal lengths, etc. And, pushing my luck I know, a parts list? Have you looked at Christian Buil's website. Some in French (use google translate if need be) though much in English too. Having read through the the LhiresIII pages I'm comfortable with the plate-work and basic engineering. The lathe-work less so but those skills aren't beyond me (he says with ease) and the necessary tooling-up would appear to be in the region of ~£700 or so. (I have accurate drilling equipment, etc already). Probably worth it. I think my first steps would be investigating what components can be adapted from existing or bought 'off the shelf' and what then needs fabricating/maching. Let's assume the bodywork/casing if fairly straightforward, it's the accuracy of those bespoke mounts that seem the real challenge. I can see why the 'kit' was such a success. All the hard bits done. I'm surprised that all the engineering diags are available 'to the public' in the way that they are on the website. Very laudable. Has anyone tried this from scratch? I dont know anyone who has built a replica LHIRES III from scratch but Ken Harrison's L200 which was also available as a kit initially and then was briefly offered commercially has a lot in common with the LHIRES design. The history of the LHIRES is an interesting one and explains why the full details are available. It came out of a pro-am conference in France where the usefulness of amateur measurements of Be stars was discussed. A spectrograph with higher resolution than was currently available to amateurs would be needed though. An amateur team (Including Christian Buil, Francois Cochard, Olivier Thizy and many others) got together to design one and in 2006 arranged for the manufacture of a kit of parts on a not for profit basis though the Aude amateur astronomy group. They expected to make perhaps a dozen but got orders for over 70 ! (I have kit #29). Requests for the kit kept coming in after the first batch so Francois Cochard and Olivier Thizy formed Shelyak Instruments to make it commercially and the rest as they say is history. ... that the kit was popular. That's some achievement. I'll have a look at Ken's design if it's still available. I'm quite optimistic that a Littrow (such as Lhires) could be made but it would take me a year and some investment. (Probably easier to take those parts to a specialist and get them made). It's down to cost/benefit I suppose. Could it be done cheaper and more accurately than a Lhires? In all likelihood, "no". Personal satisfaction apart. Many thanks for your response, very informative. What's the chances of a Lhires, L200, etc (kit or commercial) becoming available? Have you ever seen such an occurence? Working or otherwise. Just thinking about how to get a head start and even a 're-build' project. Something to help me learn the design/engineering without just buying one off the shelf. I remember a few early design L200s coming as people upgraded to the LHIRES (The early L200s had some issues, eg no guider, crude adjustable slit). The commercially manufactured version appeared to address those issues and was priced way below the LHIRES but probably too low as the company involved soon pulled out of this area so I am not sure if many were ever delivered. Also the L200 could not reach the higher resolution of the LHIRES using a 2400l/mm grating due to the mechanical design. It's essentially the same design as Cristian Buils work (a Littrow is a Littrow....) but using very basic components. I built this out of thin plywood and other scrap. I even used the objective from and old pair of binoculars, just like the spec and the only thing I bought was a "b" grade grating from Edmund Optics. It worked brilliantly! I even used it in demos about spectroscopy. 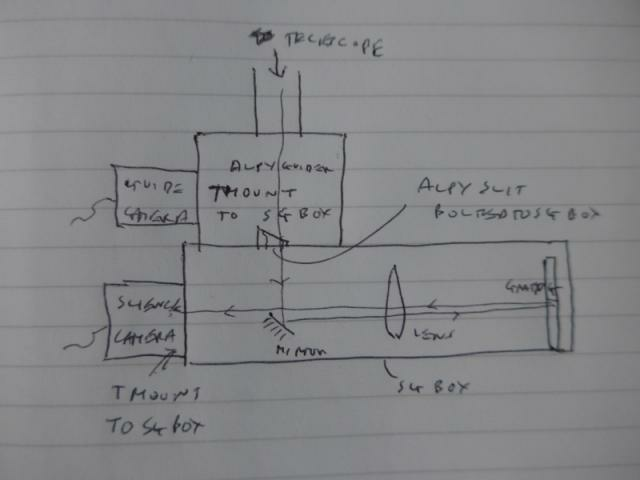 You could beef up the design for telescope mounting without too much difficulty but without a way to view the slit it's akward to use for stellar astronomy ( I tried and gave up...). Anyway, it's a very basic and cheap way to start. Alternatively the mirror slit used in the L200 is still available from the manufacturer Ovio and is significantly cheaper than the Shelyak ones. I will see if I can find the reference. Something like this perhaps ? What a wealth of info. Thanks for the info gents. Very useful. There's a few good ideas regarding a design so I'm happy that this can be done. It's the actual manufacturing that I've yet to get to grips with. I went off on a tangent when a friend of mine suggested 3D printing. I'm guessing that the actual spectro case should still have to be fabricated out of something very rigid such as metal or, as suggested, ply but the 'fiddly' stuff should be eminently 'printable'. That means the 'flat' plate-work is relatively easy and the 3D printing overcomes machining and lathe work. It's extremely cost effective (even though the machining isn't actually as expensive as I thought to get done locally). This must have been suggested or thought of before. Anyone done this? Regards (and many thanks for the input). Paul's design and manufacture are impressive although I can't afford his printer >£2,000. I might as well buy the real thing at that price! And unless you want a UVEX why not go the extra mile and do a LHiressIII? I think the sides/case could be aluminium for strength/rigidity. Being plate work it's relatively easy and avoids a big 'print job'. That means a smaller printer and associated costs. Internals are printable which are the difficult bits from an engineering point of view. It also allows experimentation. Add a few off-the-shelf bits and perhaps this is eminently doable. I'll pursue that plan. I think a printer (& software) for Christmas is in order. Need to brush up on the printing methods. PS. You're up in my neck of the woods in a couple of weeks for the Newcastle Astro session. If you fancy a pint before or after let me know and I'll show my appreciation in the usual manner!